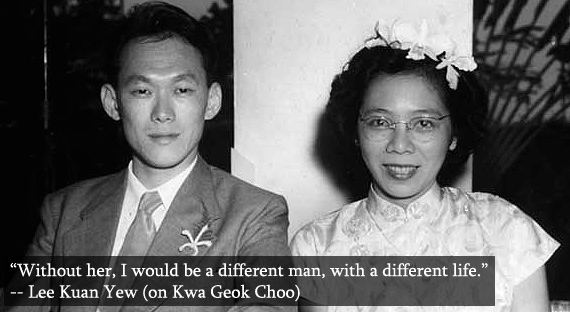 A look at Kwa Geok Choo (Mrs. Lee Kuan Yew) through the perspective of Peranakan culture. 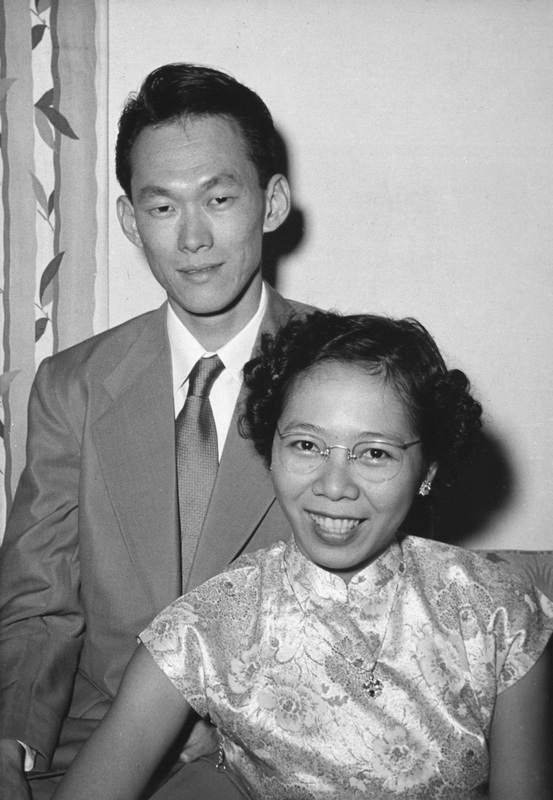 1) Madam Kwa and her husband, the late Mr Lee Kuan Yew, both Peranakans, are featured in the Great Peranakans — Fifty Remarkable Lives exhibition. 2) . . .born to a well-to-do family, studied law as a Queen’s Scholar in England’s Cambridge University, [and] remained a deeply private person. Kwa Geok Choo was described as a “proverbial dragon lady” by a former senior correspondent for The Straits Times. The whole structure of government, from the time [Lee Kuan Yew] took office, to the present day, has been designed in such a way that his son will succeed him. And the son has succeeded him, you know? Now in order to preserve that legacy that he has passed on now to his son, all the troublemakers have to be run out of town, to use an American expression. Behind all this grand scheme of things is. . .the word I’m looking for is. . .The Dragon Lady. Lee Kuan Yew’s wife. She’s the one with the overweening ambition for her son to take over. She is the one who has been advising Lee Kuan Yew what to do, how to do it, etc. But I’m telling you today, the power behind the throne is the dowager. The dragon lady, if you like. And she is very smart! That is why all these guys have to get out of the way, and they had to be ruined. Or like me, driven out of the country. If I were to go back, I would go straight from the aeroplane to jail. Kwa Geok Choo’s gold coin necklace. 1) A nyonya and her jewellery are never apart. . . the display of opulence was not just a statement of wealth but also spoke volumes of their shrewdness and austerity. 2) For the 25th anniversary of Lee & Lee law firm in 1980, the firm’s partners had two gold coins specially made for the two senior partners, Mrs Lee Kuan Yew and Mr Dennis Lee. Unbeknownst to them, Mrs Lee had a chain made for the coin, and would wear it as a necklace on special occasions and at formal functions. Long after she left the firm, partners would glimpse the gold coin around her neck when her image appeared on TV or in newspaper pictures. She was appearing at those formal functions as the wife of Singapore’s founding father. 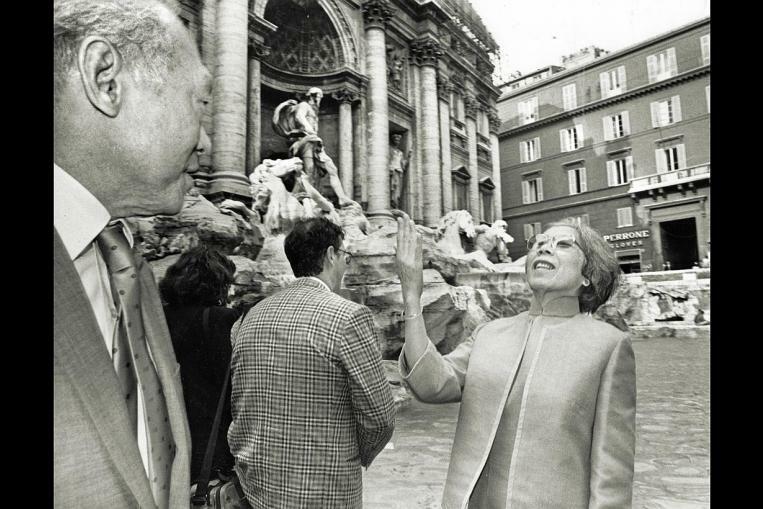 But the gold coin around her neck was a reminder that she was also a trailblazing legal luminary in her own right. LKY Family Photo. Kwa Geok Choo is seated in front wearing the gold coin necklace. 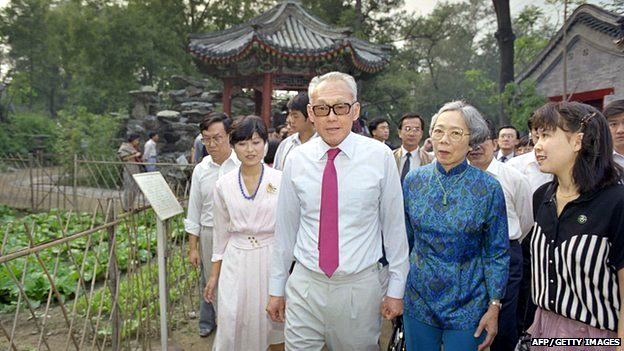 OCT 21, 1978: PM and Mrs Lee with daughter Wei Ling. Sketch of Mr and Mrs LKY by artist Siew Yan. 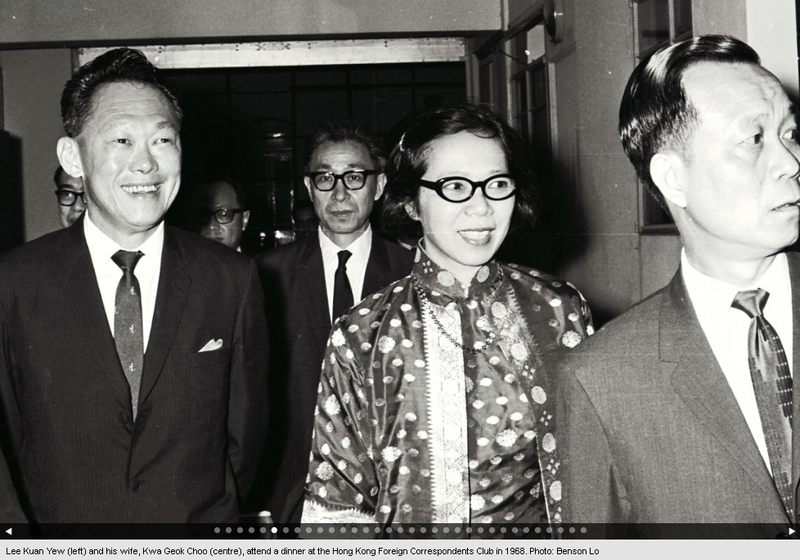 Gold coin necklace on Mrs LKY. Kwa Geok Choo with gold coin necklace and white cheongsam. Kwa Geok Choo with gold coin necklace and blue top. 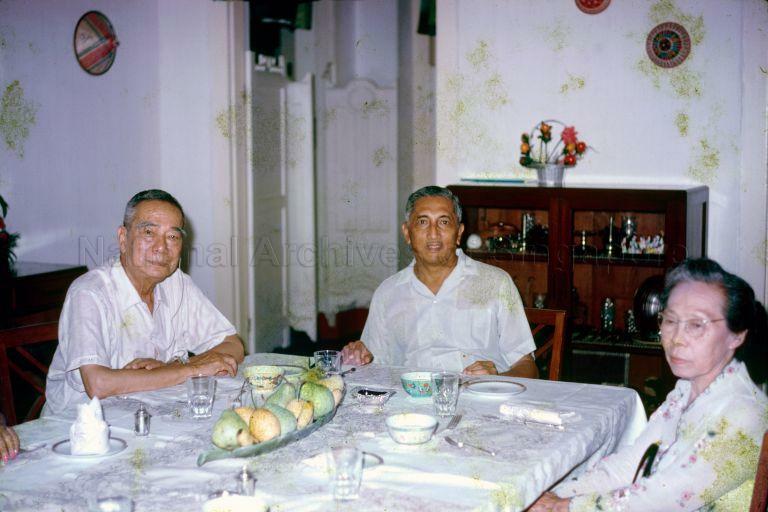 Kwa Geok Choo and gold coin necklace, with Lee Kuan Yew and son Lee Hsien Loong. Clear image of gold coin necklace. In 1968 with Emperor Hirohito and Empress Nagako in the Imperial Palace in Tokyo. Pendant in similar gold coin style (with Chinese “fu” character for fortune or good luck). 1) The Baba Culture is one that is unique to the early settlers along the Straits of Malacca. Since the 17th Century, Chinese traders arrived and lived along these coastal lands bringing with them their wealth of wares, customs, traditions and religions from the south of China. The off-springs of these ‘locally born Straits Chinese’ were called Peranakan Baba (or Nyonya for womenfolk). With the arrival of the Europeans in the 18th Century to this part of the world, the Babas were quick to adapt to the changing environment. They became the compradors or ‘go-betweens’ for the Europeans and the locals. Many Baba men held office and important positions in the Portuguese, Dutch & British governments and they rose in status & stature to become successful businessmen who even took on leadership roles in society. 2) Peranakans were bilingual, speaking English as well as their dialect of Baba Malay, and embraced influences from various religions including Buddhism, Taoism, ancestral worship and Christianity. 2) As someone who married into a Chinese/Peranakan family, [KMN’s] family does hold fast to one Perankan tradition: a powerful matriarchy. The women plan the gatherings, steer the families, and in my observations, usually have the first (and last) say on many matters of importance. 3) Chris reminded me that Peranakan families are ‘outwardly patriarchal and internally matriarchal’. Of course! Look at the Little Nyonya, scheming matrons obviously reigned over the households, pretending to be subservient to weak-minded husbands on the surface. Chris, who is Baba by the way and should be awarded some authority on the subject by way of relation, attests to the *fact* that the average Baba man is weaker than the Nyonya woman. 4) The portraits of matriarchs displayed above Peranakan Chinese altars in Malacca indicate the powerful position of the matriarch in ruling over the family. These Nyonyas came across as assertive, even bossy as they rose to the position as matriarchs in charge of running an extended family under one household. A mature Baba with great status and influence in the society would have to submit to an uncompromising mother at home. 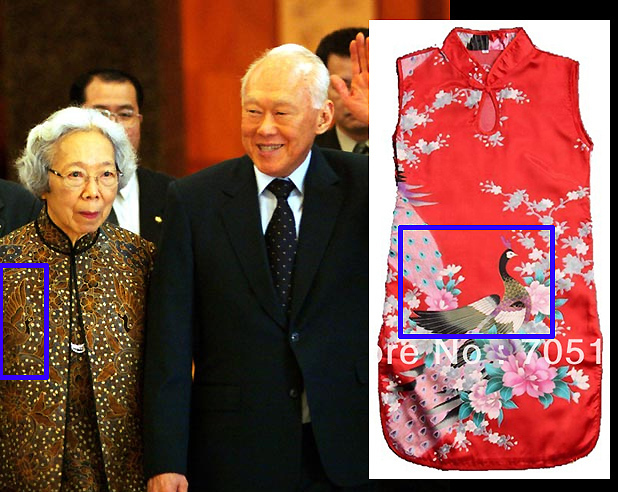 What appears to be a “Phoenix” motif on Mrs. LKY’s cheongsam. The bird has a crest of feathers on its head. 1) [Kelvin Pow] explains that the Peranakan culture is matriarchal, hence the phoenix rather than the dragon is the preferred embellishment in its decorative arts. 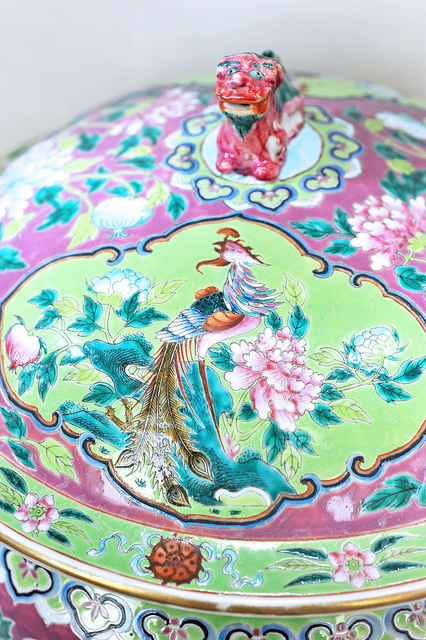 Nyonya porcelain featuring a phoenix motif, at the Peranakan Museum. 2) A typical motif used in nyonya porcelain ware is the Phoenix, a symbol of the matriarchal infrastructure of a Peranakan household. 3) The images above show the Peranakan traditional wedding costume donned on the bride. The geometric layering around her neck is the phoenix collar to symbolise the power of the feminine phoenix in Peranakan society. In contrast to her sheltered teenage years, the married Nyonya was given relatively more freedom. It was as if she had served her time, and was now qualified to manage a household and take care of herself. As she gained more confidence in her dealings with her neighbours, friends and counterparts, her role was likened to that of the strong-willed managing director of a corporation. She controlled almost everything that happened at home. In public, however, it was the husband who was seen to be the number one person. In the early days, the younger members of the community married among themselves. This desire to remain within the community was so strong that it was common for people to marry their relatives, even their cousins. The only restriction imposed involved unions between paternal cousins. Be warned that Peranakans have a way with words. Eavesdrop on two Nyonyas having an animated conversation, and you will be in for a linguistic experience that is hard to forget. 6) Lee Kuan Yew discussed the possibility of euthanasia with his doctors and family in his final years as he struggled with illness and mourned the death of his wife. Associate professor Michael Barr, who has studied and published on Singapore, said Lee had been left lost and distraught following the death of his wife, Kwa Geok Choo, in 2010, to whom he had been married for 60 years. 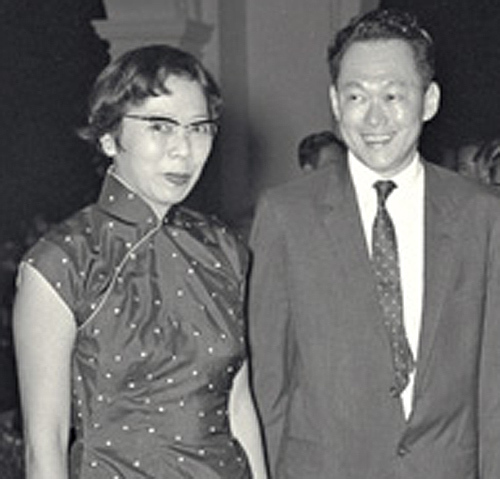 1) The late Madam Kwa, wife of Singapore’s former Prime Minister Lee Kuan Yew, was undoubtedly an excellent Peranakan woman, steel clothed in velvet, as Peranakan women were known to be! 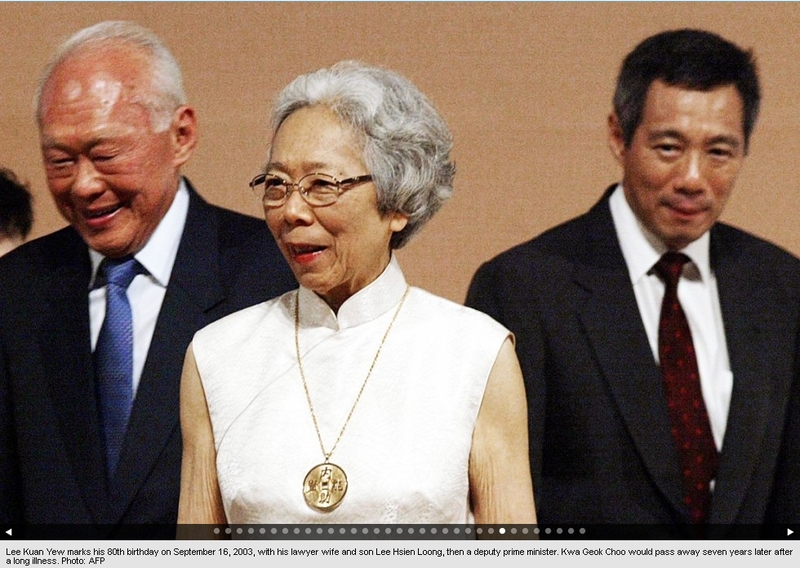 2) Mrs Lee Kuan Yew was the firm’s ‘intellectual mind‘, while Mr Dennis Lee took care of the business side of things. 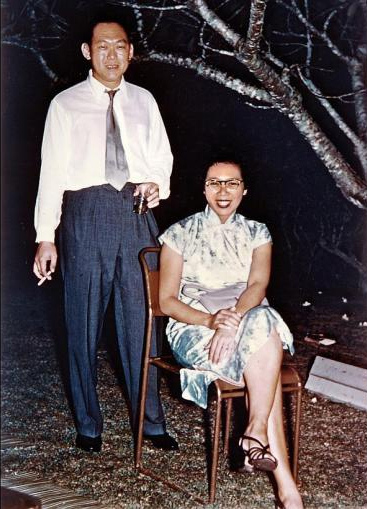 Mrs Lee’s personality, according to one prominent lawyer who declined to be named, is best summed up in the way she always dressed impeccably in a cheongsam to work, but would change into rubber flip-flops once there. 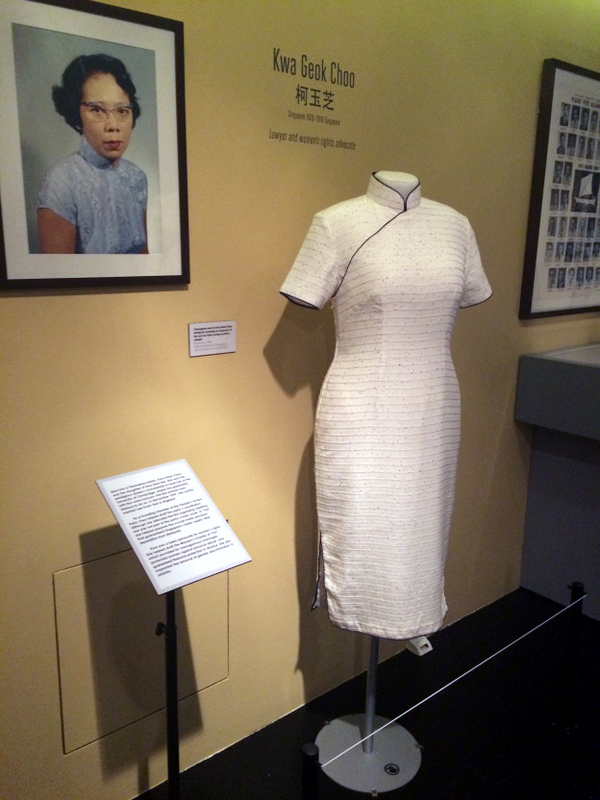 White cheongsam worn by Kwa Geok Choo. Image: Peranakan Museum. 3) In 1940, Geok Choo entered Raffles College where, to Kuan Yew’s consternation, she beat him in the English and Economics examinations. They married while in Cambridge, and graduated together with first class honours degrees in 1949. Geok Choo did it in two years; he in three. She was the first woman in Malaya to get a first class honours law degree. Though she opted to stay in the political background and play the role of supportive wife, she was a founding member of the People’s Action Party (PAP). She was highly skilled in legal draftmanship, helping to draft the PAP Constitution, and later the crucial provisions that guaranteed Singapore’s continued water supply when Singapore separated from Malaysia. 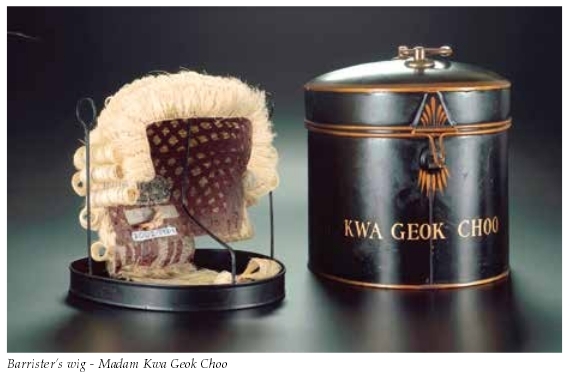 4) Standing proudly atop its box on the third floor of the Peranakan Museum, the barrister’s wig that belonged to the late Madam Kwa Geok Choo (21 December 1920 – 2 October 2010) is very much a tribute not only to its erstwhile owner, but also to the era’s fledgling coterie of able Peranakan women. Kwa Geok Choo’s barrister’s wig. 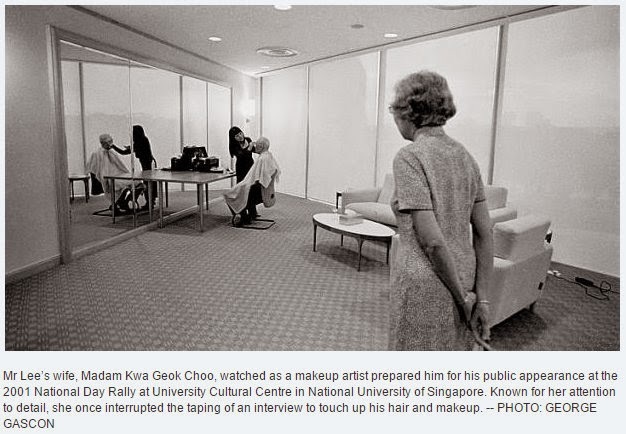 5) Known for her attention to detail, Kwa Geok Choo once interrupted the taping of an interview to touch up [Lee Kuan Yew’s] hair and makeup. The family requests that no obituaries and no wreaths or flowers to be sent. All donations will go to the National Neuroscience Institute (NNI) Health Research Endowment Fund. 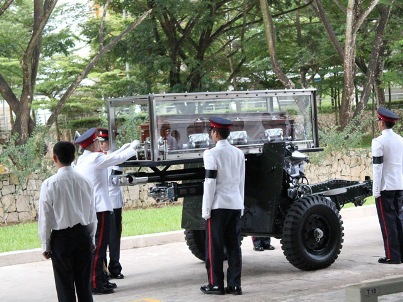 The glass-encased brown coffin of Kwa Geok Choo, who died aged 89 on Saturday after a long illness, was transported to a suburban crematorium on a ceremonial gun carriage normally reserved for state and military funerals. Her political legacy runs deep. In 1959, she delivered her first and only party political broadcast during the general election that year, urging women to vote for the PAP. She was the only English-speaking woman in the party who had the requisite firmness and conviction for the broadcast. ‘I have been proof-reading and sometimes correcting [Lee Kuan Yew’s] speeches from his earliest 1950 speech to the Malayan Forum in London,’ she told The Straits Times in 1998. The early history of the People’s Action Party (PAP) also bears the stamp of her involvement. Drafting the rules of a society, by contrast, was her speciality. 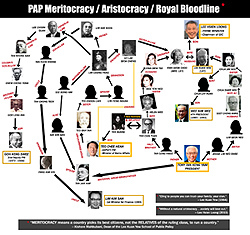 This blog post has a family tree of Kwa Geok Choo’s relatives holding government positions in Singapore. Really shocking! I did not even know she is of Peranakan heritage. 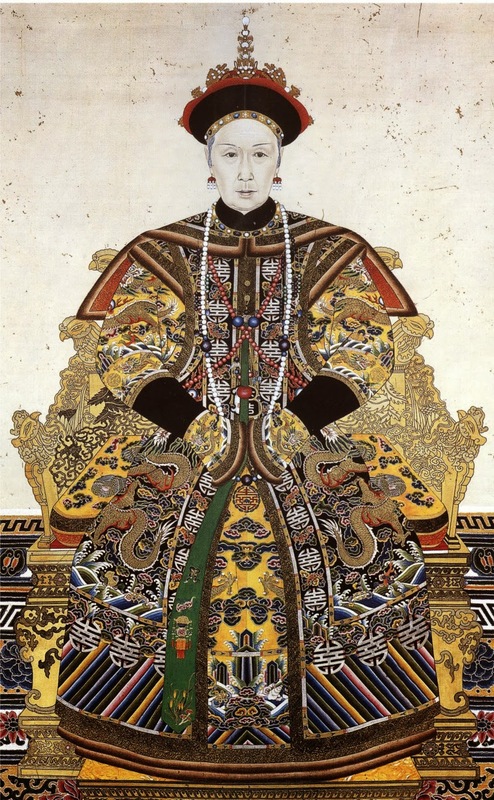 I am a Peranakan too and by right my Empress Dowager should be the Dragon Lady to my father (having more control so he spends lesser time in Malaysia with his 13 siblings), but she is only Dragon Lady to me. The irony. My Empress Dowager once said he needed $$$ to take control of SG, and what better way than to hook up with someone smarter and richer. But their admiration for each other cannot be denied. It’s great to read and learn of such info…why SG history never teach these?